"Paws & Hearts" Animal Assisted Therapy is a Pet Therapy Visitation Organization, which was founded in December, 2000 by Richard and "Lucky" Waxman. We are a registered Not-For-Profit (501 C3) community based volunteer group. 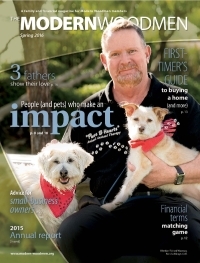 Featured in the "Modern Woodmen Quarterly Magazine"
"Paws & Hearts" Animal Assisted Therapy is a leader in the field of "Animal Assisted Therapy" (AAT) and it is our mission to enrich the lives of the frail and special care cases that require the loving attention and affection that only a "four-legged" healer can provide. 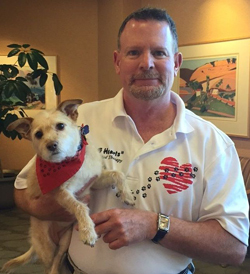 Just imagine being laid up in a hospital or convalescent center and into your room strolls a four-legged Canine Ambassador from "Paws & Hearts" Animal Assisted Therapy. The greater presence of animals in health-care settings comes amid increasing evidence that pets are good for us and can play a significant role in patients' recovery. Referred to as "Pet Therapy" or "Animal Assisted Therapy", pet visitations have become an important tool for doctors and rehabilitation specialists. 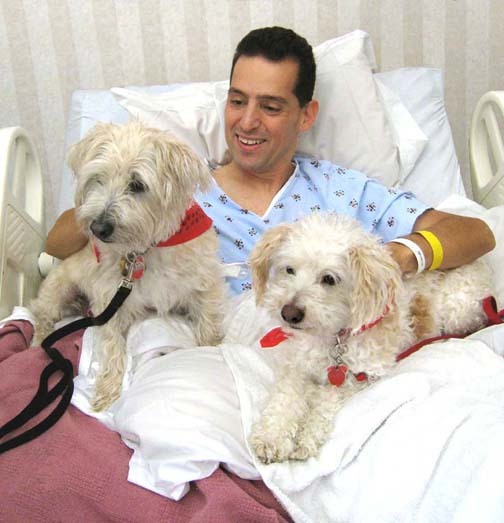 Animals motivate people to participate in their therapies, brighten patients' days, give them a chance to talk about the animals in their lives, and give them the opportunity to forget they're in a hospital. Clinical studies have already shown that petting a dog or a cat lowers blood pressure, and has an overall calming effect on patients. But just as important as the clinical benefits, visiting pets give the patients a real breather from their current situation. "My Mother was in respite in the hospital. The day one of your Canine Ambassadors came to visit was my mother's best day! All she did was talk about how sweet and gentle the dog was and how happy he made her feel. You have no idea how wonderful this program is!" Much has been written lately about the difference between dogs used for Pet Therapy and Service Dogs. Both titles have distinct differences both in the training and what the dog ultimately is used for. At "Paws & Hearts" Animal Assisted Therapy we only train dogs for use in health-care settings and they have the classification of Therapy Dog, or as we term them, Canine Ambassador. And that's it! We do not require basic obedience class or the Canine Good Citizenship award. Our evaluator is looking for dogs that are incredibly friendly, outgoing, curious about new surroundings, who interacts exceedingly well with strangers on a first time meet and greet. If a dog is good at this, and takes simple commands from its human parent it will pretty much pass the test and be ready for training. "Paws & Hearts" Animal Assisted Therapy is a 501c3 Non Profit Animal Assisted Therapy Organization located in Palm Desert, California. Volunteer handlers and their Canine Ambassadors visit their assigned facility once per week. Please consider becoming a Volunteer Team with our organization. Please enjoy our site and email us at with your questions. Now that you have read through the Home page and understand what it is we are looking for in a potential Canine Ambassador, please give our office a call at (760) 836-1406 to have your first informal interview. If the phone interview goes well, you will be invited to complete the formal Volunteer Application. Please keep in mind, that we are located in a seasonal area. The desert is home to many 'winter snow-birds'. We only accept full-time desert dwellers who are able to make an initial commitment of one-year, visiting their assigned facility each and every week. Richard and his mascot dog, Maddie, look forward to hearing from you! doing what they do best, sharing love and comfort to a patient at Eisenhower Medical Center.